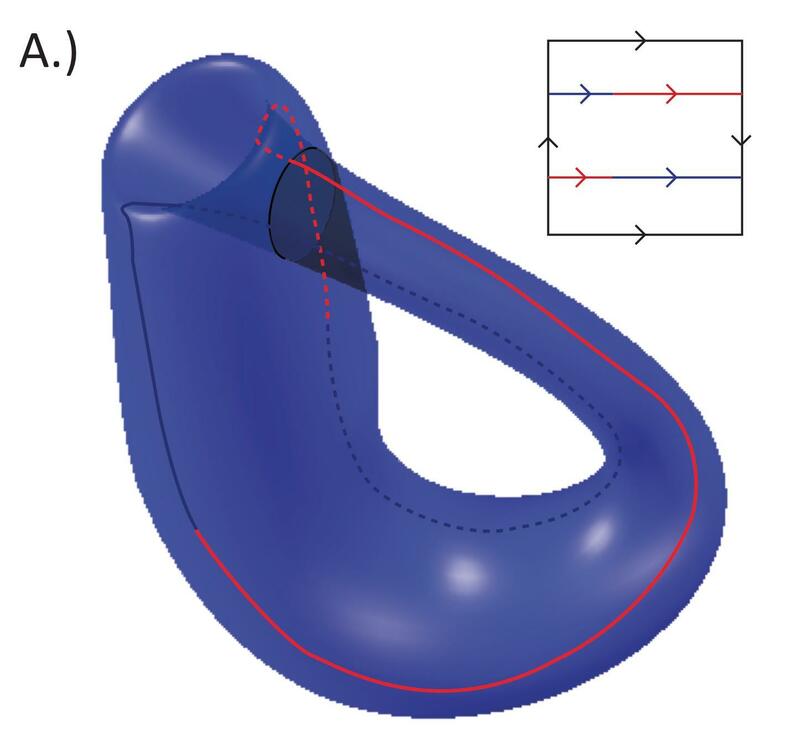 (A) Klein bottle, or the non-orientable surface of genus 2; The fundamental polygon representation of the Klein bottle is shown in the inset. (B) The orientable double cover of the Klein bottle is the orientable surface of genus 1, or the toroid. Closed loops on the double cover that traverse the non-orientable boundary— red/blue line in (B)— wind around the non-orientable surface in panel (A) twice. In this work we study a model of quantum gravity on two-dimensional, non-orientable manifolds, for example a Klein bottle. We find that for a simplified version of quantum gravity called U(1) BF theory, a generalization of U(1) Chern-Simons theory, the fact that the manifold is non-orientable induces severe constraints on the values allowed for the coupling constant appearing in the action; in fact it can only take values of ½, 1, or 2. This comes about because the coupling constant appears in the commutation relation (or uncertainty relation) for the fields, and because the fields in the effective gauge theory must be consistent with the discrete symmetry groups for homeomorphisms on manifold. These discrete symmetry groups include the large gauge transformation group, the holonomy group, and the mapping class group. Gravity has been simpler to study in 2 space dimensions and 1 time dimension. In these dimensions, Einstein gravity can be reformulated as a topological field theory: A field theory with enough gauge symmetry so that the only observables are topological invariants, which significantly simplifies the model and allows for exact quantizations. The relevant gauge field models for (2+1)D gravity, such as Chern-Simons theory or BF theory are ill-defined if the manifold is non-orientable however, even though such manifolds could still exist in a quantum gravitational theory. In this work, we develop a formalism to restore the relation between quantum gravity and topological field theories by generalizing the gauge field models. We achieve this by identifying one of the gauge fields in the BF theory to be a 1-form density field, while keeping the other field as a regular 1-form field. As a result, the BF theory becomes well-defined on a non-orientable manifold, and can be related with (2+1)D gravity with arbitrary cosmological constant. 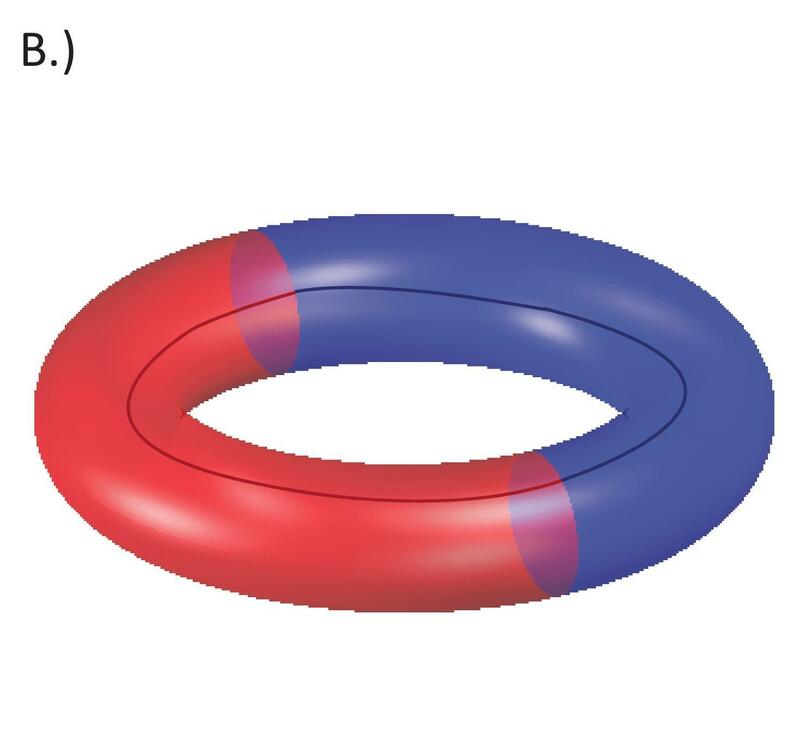 As well, Chern-Simons theory can be defined on the orientable double cover space of the non-orientable manifold, and can thus be mapped to the BF theory (see Figure). We applied the formalism to the quantization of BF theory with the U(1) gauge group, on the spacetime manifold R × Ng, where Ng is the non-orientable compact surface of demigenus g. When g=2,3, a tractable presentation of the mapping class group of Ng is known; for these cases we derived explicit, finite-dimensional representations of the mapping class group, large gauge transformation group and the holonomy group, as well as the finite-dimensional Hilbert space of the model. We found that in this process, the possible values of the coupling constant appearing in the BF action is severely restricted to just a few choices: k= ½, 1, or 2. Si Chen received his PhD in Physics with Steven Plotkin at the University of British Columbia, and is currently a post-doctoral fellow in the Department of Physics at Uppsala University. Don Witt and Steven Plotkin are faculty in the Department of Physics and Astronomy, University of British Columbia, Canada. This entry was posted in Author Insights, IOPselect and tagged quantum gravity, topological field theory by Adam Day. Bookmark the permalink.